Press #1 5 FT. x 12 FT.
SDM Technology 5 Ft. x 12 Ft. SDM Dual Loader LAMINATOR Series 2003-600T, two opening, composite press. The press is designed for years of trouble free service. This equipment is the finest composite press you can buy. The hydraulic power pack utilized an efficient air over oil high pressure system. The cylinders are custom made for SDM by Eaton. This press can easily deliver 150 psi over a 5 Ft. x 12 Ft. composite and still apply very uniform low pressure loads ( 15 PSI ). The platens are temperature tuned with proprietary diverters that yield the most uniform temperature obtainable. The MAX-RAMP platens allow fast uniform temperature changes within the platens. Platens are blanchard ground flat and parallel within 0.004 inches. The press is ideally suited to produce laminates and honeycomb panels. SDM Technology Dual Loader Laminator Series 2003 $170,000 SOLD Can we Build One For you? Expansion tank, all manifolds, hoses and valves required. SDM Technology 5 Ft. x 8 Ft. SDM LAMINATOR Series 2003-450T, two opening, composite press. The press is designed for years of trouble free service. This equipment is the finest composite press you can buy. The hydraulic power pack utilized an efficient air over oil high pressure system. The cylinders are custom made for SDM by Eaton. This press can easily deliver 150 psi over a 5 Ft. x 8 Ft. composite and still apply very uniform low pressure loads ( 15 PSI ). The platens are temperature tuned with proprietary diverters that yield the most uniform temperature obtainable. The MAX-RAMP platens allow fast uniform temperature changes within the platens. Platens are blanchard ground flat and parallel within 0.004 inches. The press is ideally suited to produce laminates and honeycomb panels. SDM Technology Laminator Series 2003-450T $130,000 SOLD Can we Build One For you? Pricing and Features subject to change. We will verify availability, features and price with a written quote. Please check with SDM Technology to verify availability of "in stock" inventory presses. 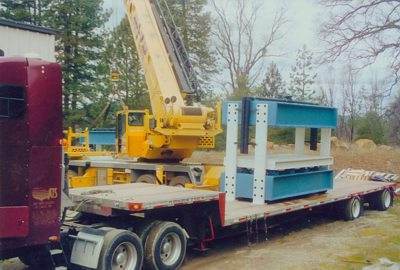 Other SDM TECHNOLOGY presses may be available for immediate sale or we can build one to your custom specifications. Contact SDM for further information.